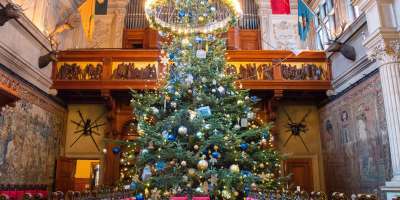 Biltmore shines with holiday grandeur as Christmas at Biltmore 2017 gets underway. Magical. 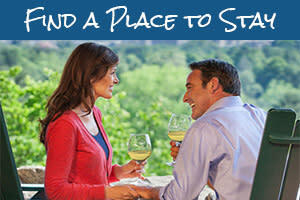 That&apos;s the word guests so often use when describing Biltmore during the holidays. Ornate decorations transport you back in time and showcase a tradition that dates back more than 120 years. 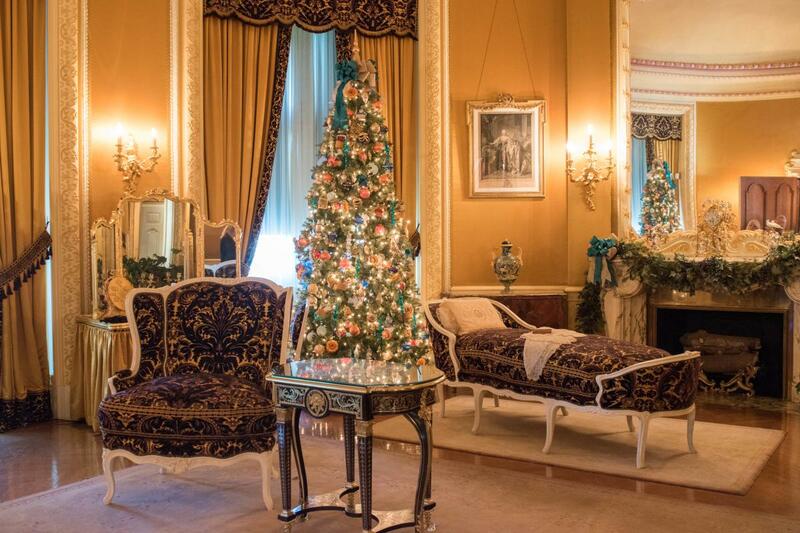 The stunning decorations inside the home and across the estate feature more than 100 hand-decorated trees, including the 35-foot Fraser Fir that anchors the grand Banquet Hall. 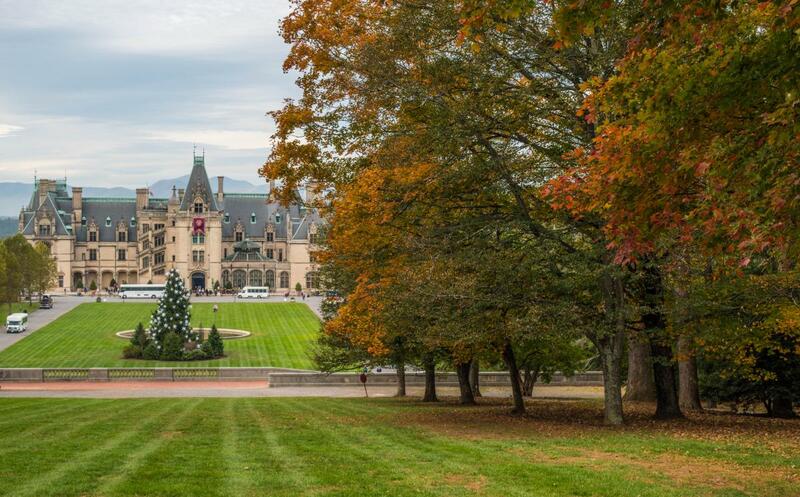 Thousands of lights help Biltmore to sparkle. And, poinsettias brighten the rooms inside the home and in the Conservatory garden. 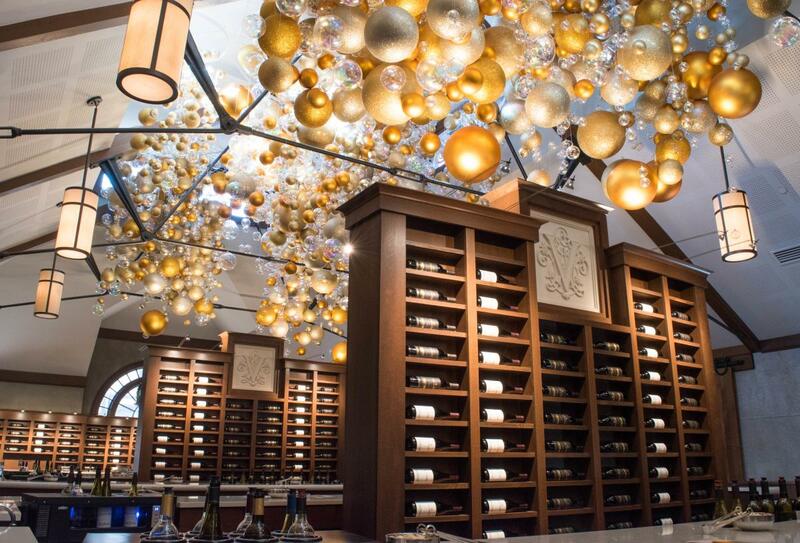 New this year are 7,000 globe-shaped ornaments that adorn the ceiling of the Biltmore Winery. Come join us on this photo tour of the 2017 decorations in some of the home&apos;s most iconic rooms. These photos were taken during the daytime Christmas at Biltmore celebration. At night, Biltmore lights the dozens of fireplaces in the home and live music adds to the special ambiance for Candlelight Christmas Evenings. 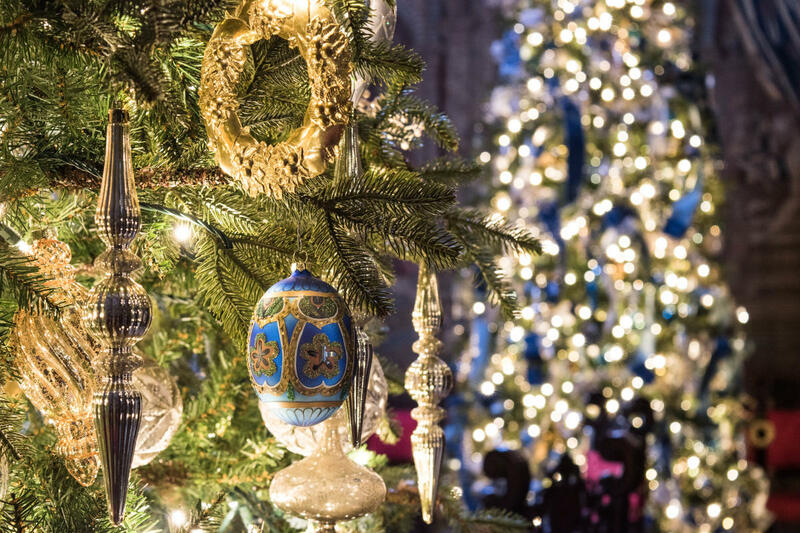 While these photos provide a sneak peek, you&apos;ll find visiting the estate in person is how you&apos;ll truly feel the magic of Christmas at Biltmore. 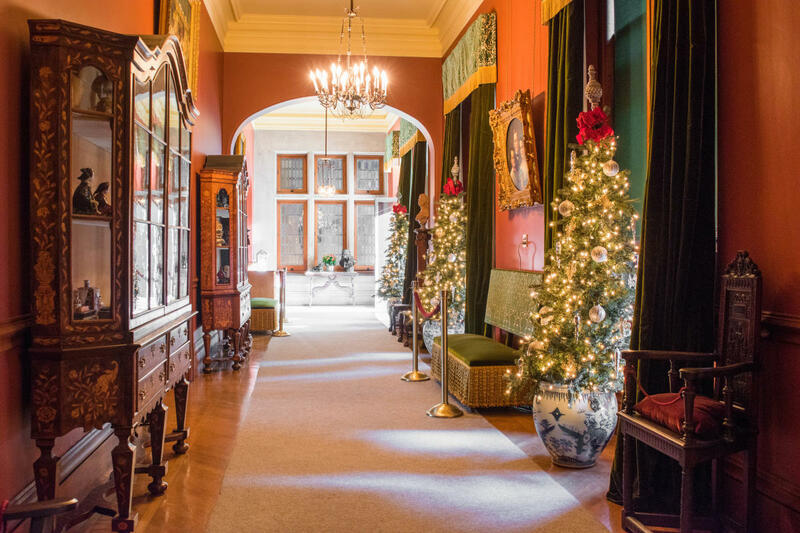 Christmas at Biltmore runs November 3, 2017 through January 7, 2018. 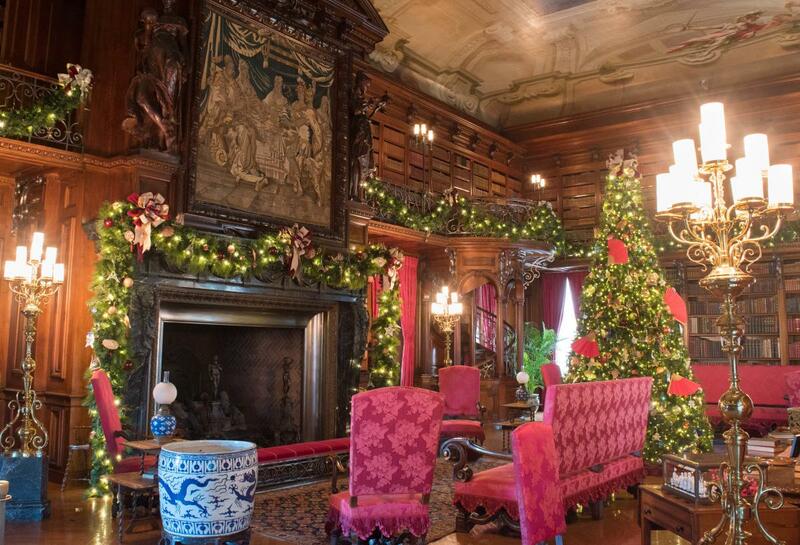 Plan your visit today with the help of our Christmas at Biltmore guide. 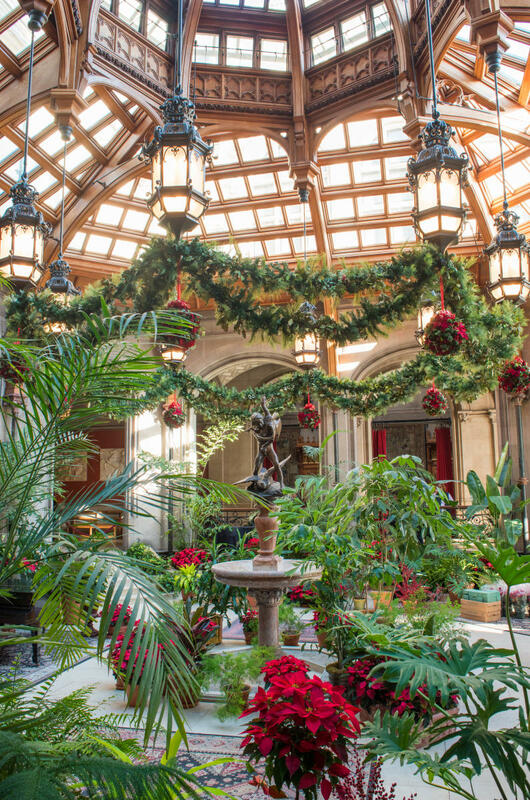 When you enter Biltmore House, one of the first rooms you&apos;ll see is the Winter Garden. Beautiful natural light illuminates the poinsettias and natural garland. 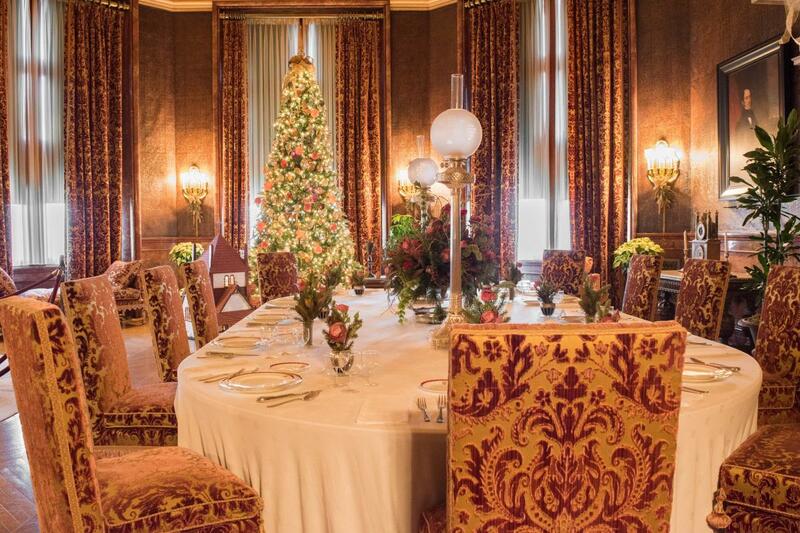 The 7-story high Banquet Hall is the centerpiece of the Christmas at Biltmore celebration. A 35-foot Fraser Fir is trimmed with packages, lights and ornaments. 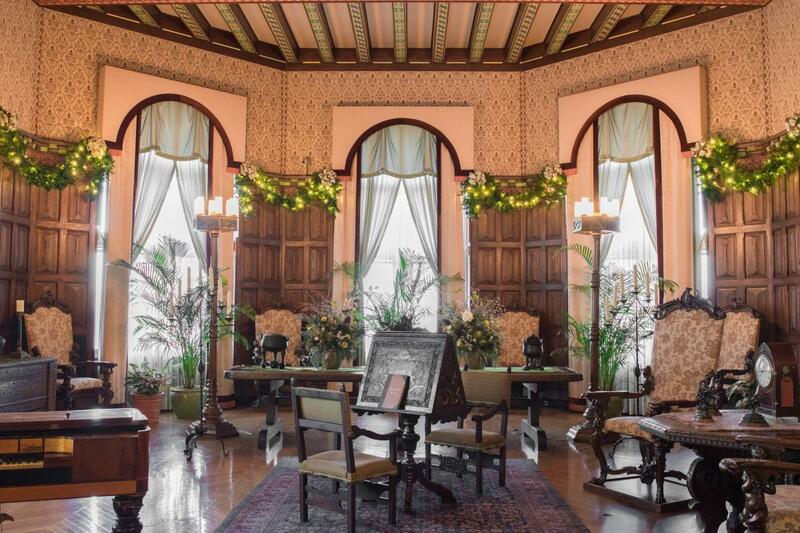 The grand fireplace, lit during the evenings for Candlelight Christmas Evenings (requires separate admission), is decked with matching-colored adornments. Steps away, you&apos;ll find the inviting Breakfast Room. Next to the Christmas tree in this room, you&apos;ll notice a small house -- this is a replica of the All Souls Cathedral in Biltmore Village. Simple holiday elegance is what you&apos;ll find in this beautiful room. 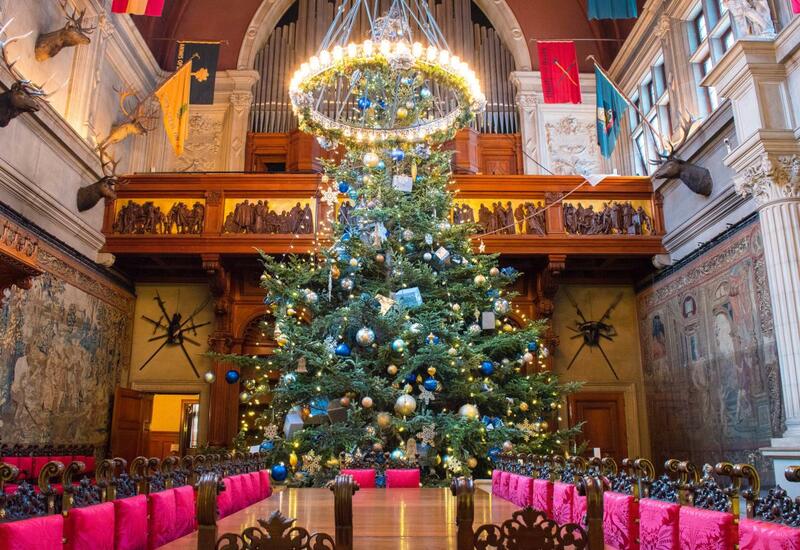 A row of sparkling Christmas Trees help illuminate the intricate tapestries. A large nativity scene serves as a focal point in the center of the room. George Vanderbilt loved reading and had a personal collection of 22,000 books. Garland and bows frame the large fireplace in his library. 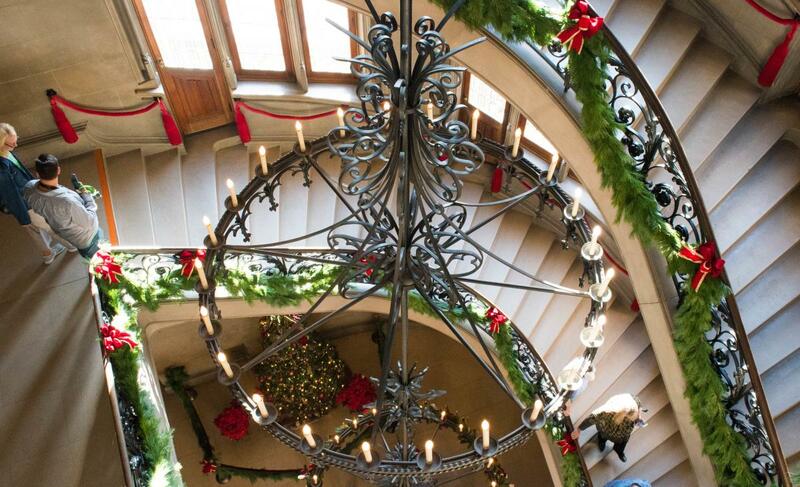 The spiral staircase leads the way to the bedrooms upstairs. What a whimsical wine tasting setting! 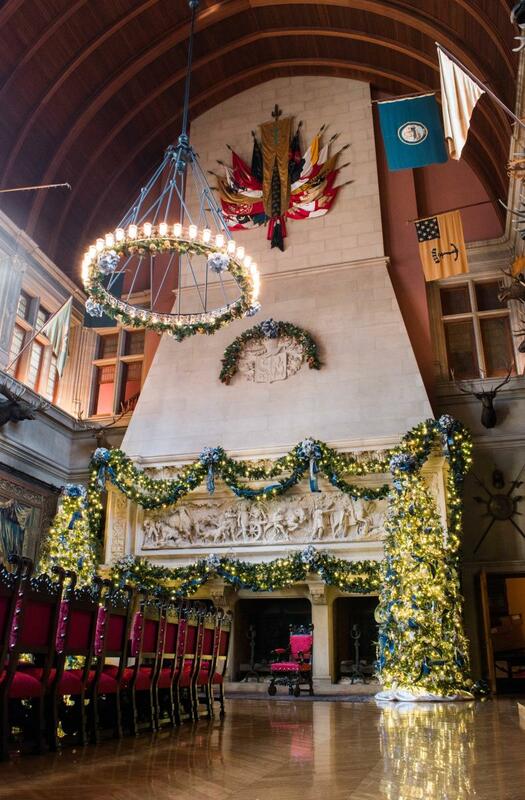 The 7,000 globe-shaped ornaments carefully hung from the ceiling are new this year for the Christmas at Biltmore celebration. 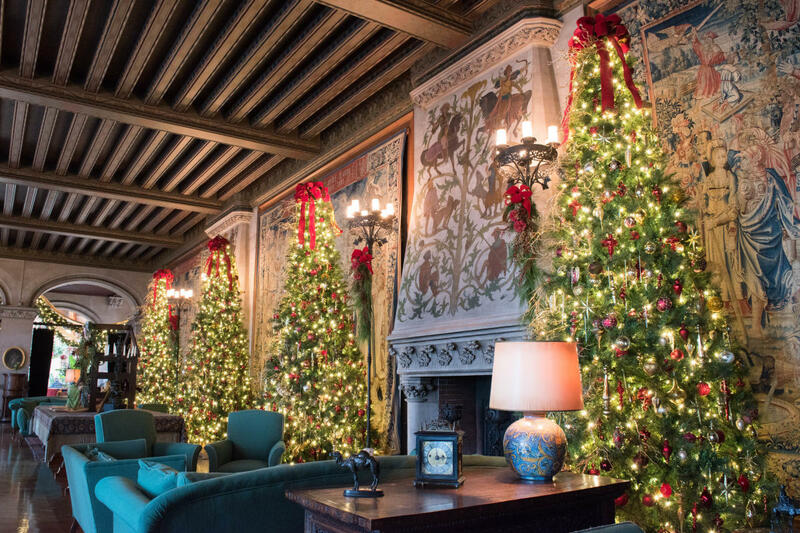 Plan your trip to Biltmore today with our 2017 Christmas at Biltmore guide. 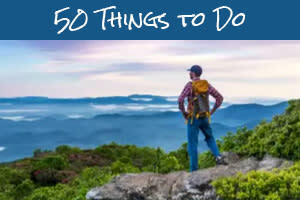 And, check rates and availability for local accommodations for your stay. 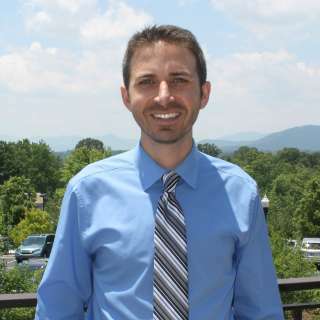 Photos by Explore Asheville&apos;s Jason Tarr.